Shares are available for immediate purchase in this superbly bred filly, purchased by Kelly for $77,500 + GST, at the 2019 March Magic Million Yearling sale. 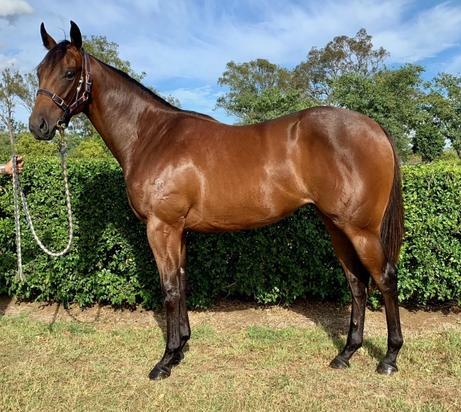 By the 2yo super sire SPIRIT OF BOOM, out of RIGHTFUL LADY, a proven black type producing family, this filly looks to be an early running type, eligible for those all important QTIS bonuses. Setfire to Therain (f. by Monashee Mountain). 2 wins at 2, A$113,800, BRC Salt Design 2YO H., Driver Recruitment 2YO H.
Tax Exemption (g. by Ad Valorem). 7 wins to 1400m, A$91,935 in Aust. Zeeva (f. by Greenwood Lake). 3 wins to 1200m in Aust. Siouxsie (f. by Rocker). Placed to 2018-19 in Aust. Cameo Minx. 4 wins from 1600m to 2050m, A$117,765, MVRC Vertical Talent H., MRC Princess Veronica H., Conbituate Lady H., MVRC Slickpix P., 2d VRC Natalie Short & Nicholas Ward H., MRC Tower Belle H., Nunkalowe H., 3d MVRC Arrow Training Services H., Slater & Gordon Lawyers H., MRC Bianco Flyer H., Mitty's Rising Stars Final H. Producer. Miss Pandanus. 2 wins at 1200m, 1250m in 2017-18, 2d MRC Ladbrokes Info Hub H., 3d MRC Clanbrooke Racing H.
Night Magic. Winner at 2000m, 2d MRC Siren Song H. Producer. MACQUARIE PRINCE (Best Western). 9 wins from 1550m to 2800m, A$262,330, AJC Colin Stephen H., Gr.3, STC Christmas Cup, L, Winter Cup, L, TNT Diners Club Card Welter H., City Tattersall's Club H., 2d Newcastle Gold Cup, Gr.2, AJC Battle Heights Welter H., Grange Stables Welter H., 3d Newcastle Gold Cup, Gr.2, AJC Warwick Farm Spring Cup, L, NSW Tatt's RC Tattersall's P., L, STC WJ McKell Cup, L, AJC Mt Pleasant Philip Welter H., Bert Lillye Welter H., STC Shelleys Welter H., 4th AJC Metropolitan H., Gr.1-twice, Warwick Farm Spring Cup, L.
FIRST SEAL (Fastnet Rock). Champion Female Sprinter in Australia in 2015-16. 6 wins from 1100m to 1600m, A$1,259,060, ATC Flight S., Gr.1, Surround S., Gr.2, Tea Rose S., Gr.2, Millie Fox S., Gr.2, MRC Tristarc S., Gr.2, ATC Daily Press Group P., 2d ATC Coolmore Classic, Gr.1, Canterbury S., Gr.1, Vinery Stud S., Gr.1, Spring Champion S., Gr.1, Light Fingers S., Gr.2, TAB Early Quaddie H., 3d MVRC Sunline S., Gr.2, 4th ATC George Ryder S., Gr.1. TELEPLAY (Written Tycoon). 3 wins at 1100m, 1200m, A$186,050, to 2018-19, VRC MSS Security Sprint H., L, 2d MRC Sam Segman H., 3d MRC Mannerism S., Gr.3, MVRC Ladbrokes VOBIS Gold Carat.